Oh, my gosh. 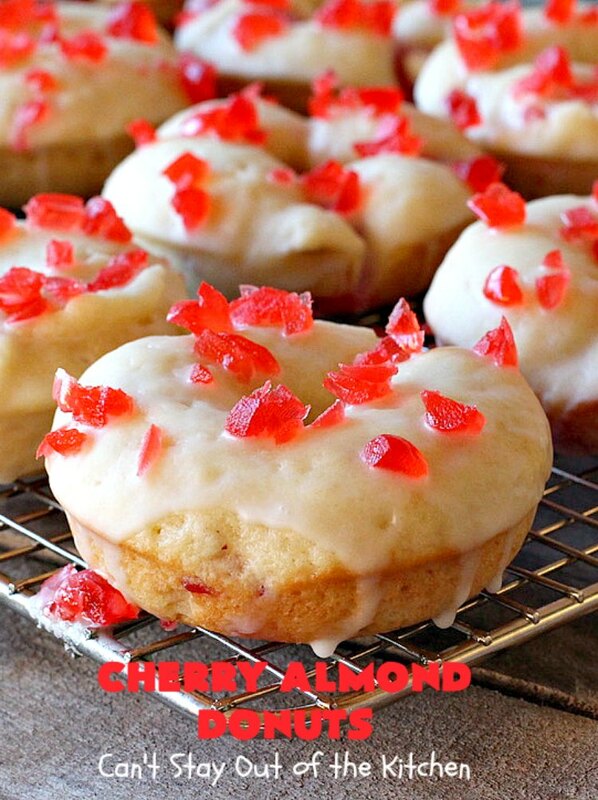 Cherry Almond Donuts. Let that sink in. These delectable donuts are absolutely awesome. The donuts are filled with candied cherries and almond extract for maximum flavor. They’re glazed with a luscious almond powdered sugar icing. Then chopped up candied cherries are added on top. They will certainly cure any sweet tooth craving you’re having. 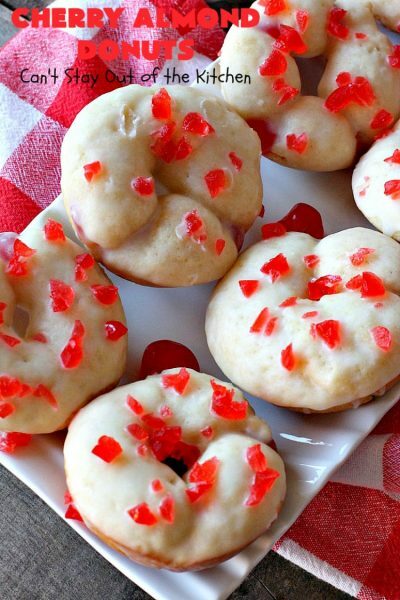 Plus, these donuts are just about irresistible. I used candied cherries (since I made these in December). You can also use fresh or maraschino cherries. Just make sure to rinse and dry them really well before using. 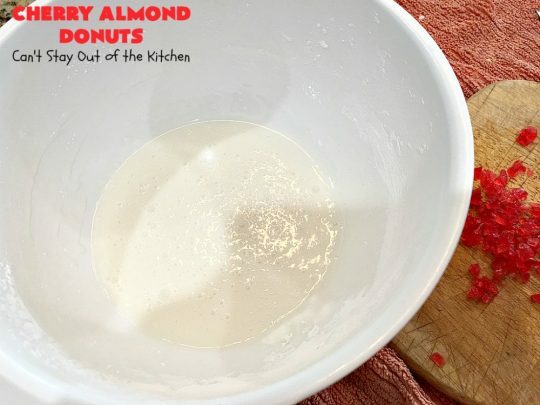 I used almond extract in the donut and the icing. 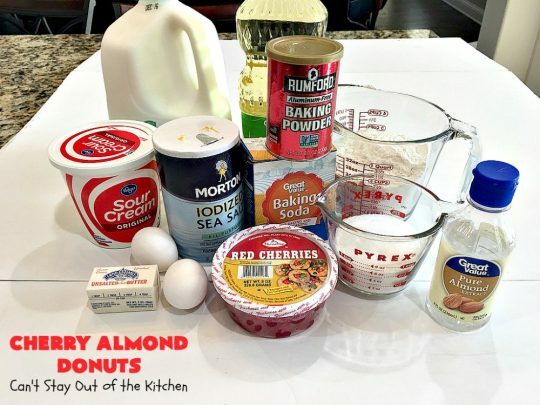 I was planning on using chopped up almonds on top of the donuts. In the end, I decided to skip the extra chopped almonds. I allowed the extract to be enough flavoring for the donuts and the icing. Yes, they were marvelous. I kind of wimped out on my regular cookie baking last December. So I decided to bake up a bunch of donuts for John’s office instead. I was on a donut tear. I made Glazed Blueberry, Glazed Raspberry, Glazed Pumpkin, Lemon Poppyseed, Orange, and these scrumptious cherry flavored donuts. I got so much wonderful feedback from all those who loved the donuts. In fact, a few people made sure John knew that they needed to be notified the next time I made donuts. Apparently, they were all cleaned out by the time they got there! So, in early January I made several more flavors of donuts for John’s office. Again, we got terrific notes and thanks from so many who enjoyed them. I think they would like me to bake donuts for his office every week if I had time. Unfortunately, if I did that, I would never be able to blog about them! Anyway, donuts are just the best. They are definitely my comfort food of choice! 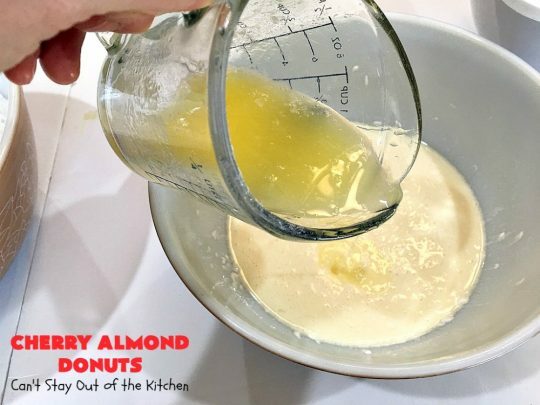 I have to admit, I love baking donuts. I’ve scheduled them to be made for our Friday night care group this week. I’m also baking them for “Breakfast for Dinner,” for our college group next week. Every time I tell people I’m making homemade donuts, you wouldn’t believe the reactions I get. “Really?” Their eyes get big, smiles crease their faces, and the drooling begins! One of the college gals asked me if she could come over and help me make donuts this Friday. 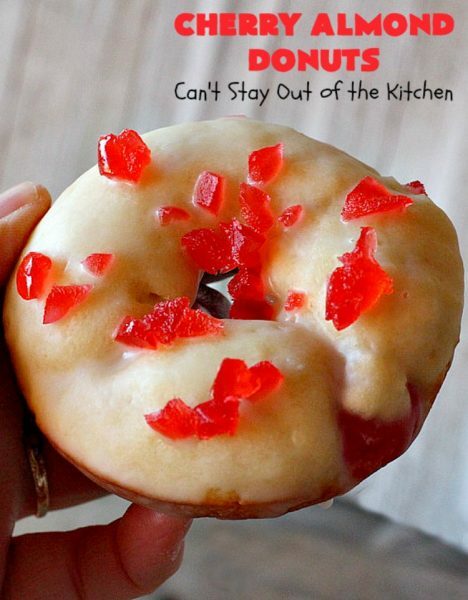 I said, “sure!” Yes, homemade donuts are always a delightful treat for everyone we know. 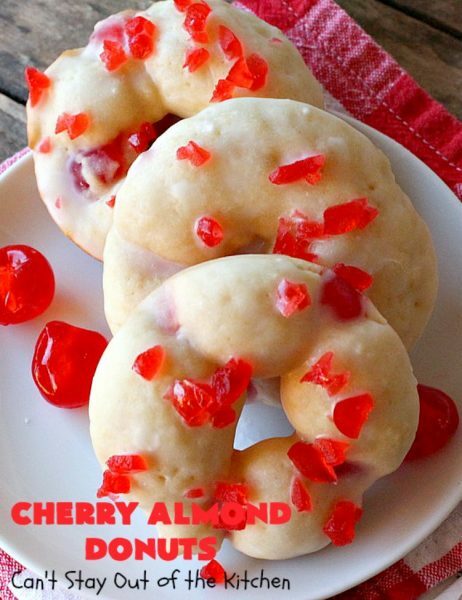 If you enjoy cherries, you’ll love these Cherry Almond Donuts. As I stated earlier, you can use candied, fresh or maraschino cherries. Just make sure that the cherries are rinsed (from all syrup) and dried thoroughly before using. While I used whole cherries in the donuts, you can also chop them up if you prefer. That would provide more cherry flavor in every bite. I recommend serving these for a special Valentine’s Day breakfast next week. 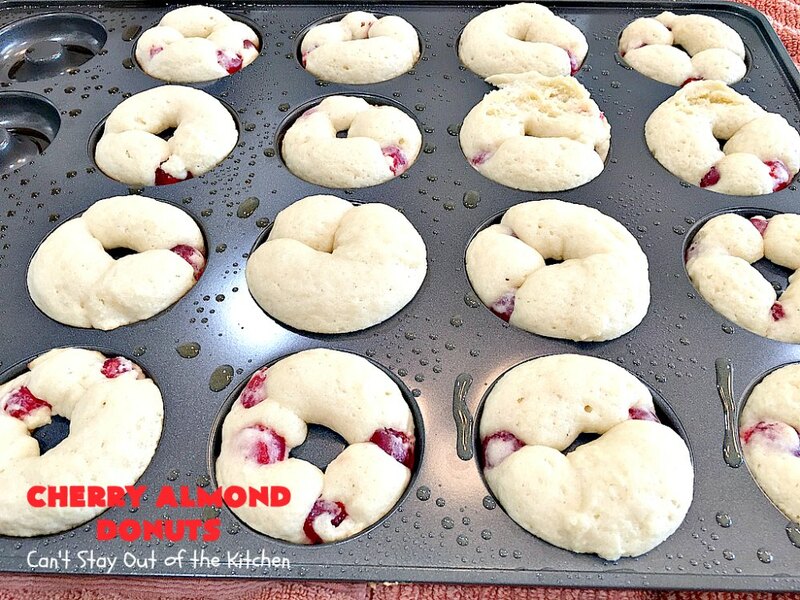 Your spouse or favorite person will go over the moon for a bite of these delicious morsels for breakfast. For that matter, your kids will probably enjoy them just as much. 🙂 Drool, baby, drool. 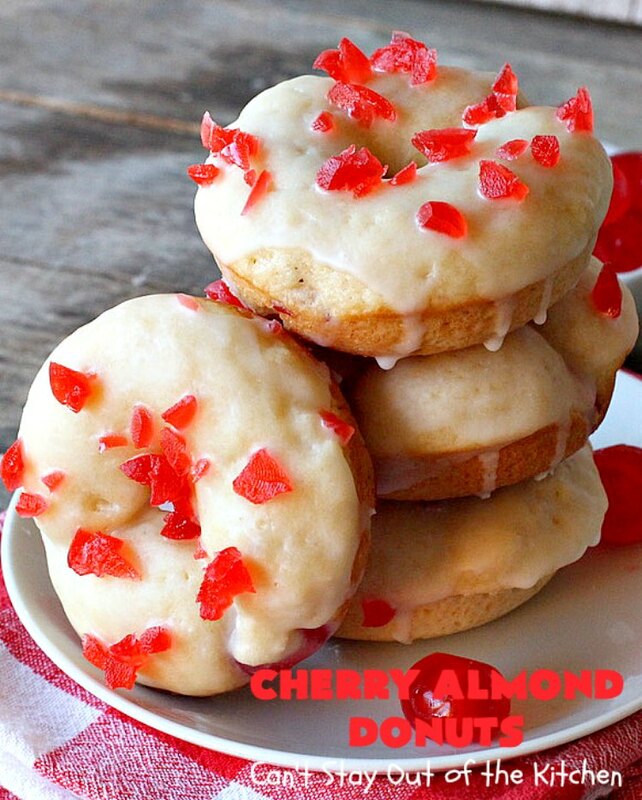 Cherry Almond Donuts are so mouthwatering. 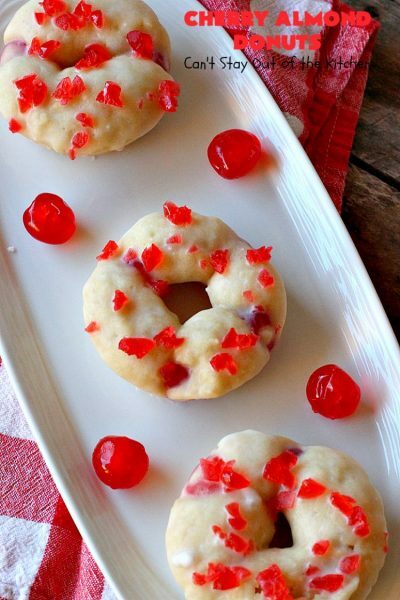 These luscious donuts are terrific for holiday breakfasts. 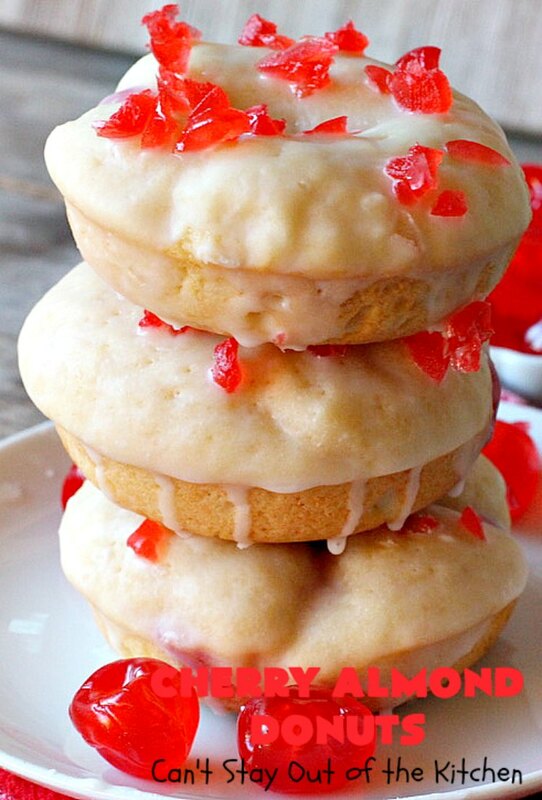 If you enjoy donuts for breakfast or brunch, you’ll love these! 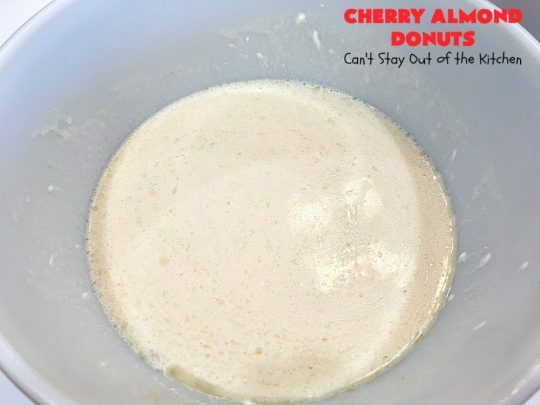 Cherry Almond Donuts will get your motor going! Place UNBLEACHED flour in a mixing bowl. (Bleached flour toughens baked goods). Add sugar, baking soda, baking powder and salt. In another mixing bowl, combine eggs, sour cream and milk. Add melted butter, almond extract and canola oil. Add candied cherries. (You can chop them up if you prefer smaller pieces). Stir ingredients just until combined. Do not overmix the batter. Spoon ingredients into a zip lock bag. 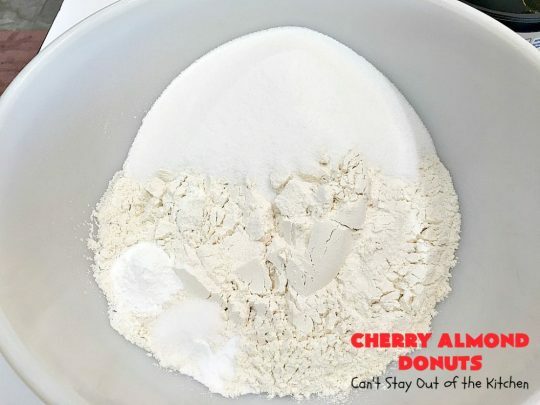 Cut off one quarter and pipe donut mixture into greased donut cavities. Bake at 425 for 10 minutes, or until a toothpick inserted in center comes out clean. 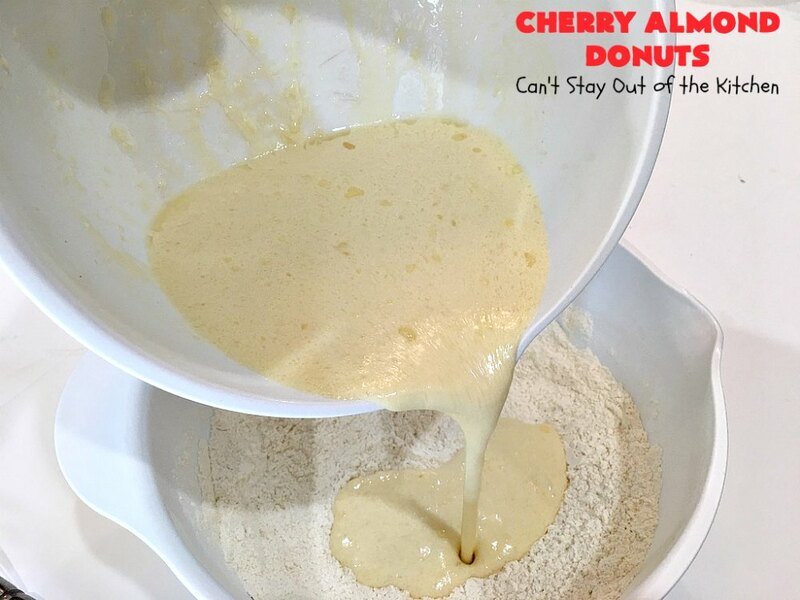 Allow donuts to cool about 2-3 minutes then remove donuts to a cooling rack. 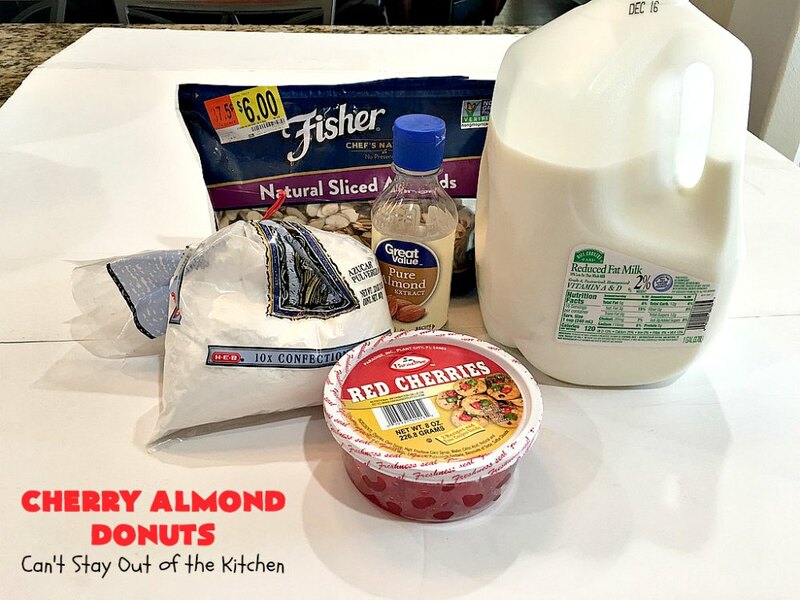 I used these ingredients for the icing, but I skipped the almonds. Whisk to combine. Chop up the cherries and have them ready to sprinkle on top. Invert the donuts so the tops are swished in the icing mixture. Place on a cooling rack. Immediately sprinkle chopped cherries on top of the icing. This must be done before you move on to the next donut, so the cherries will adhere to the icing. 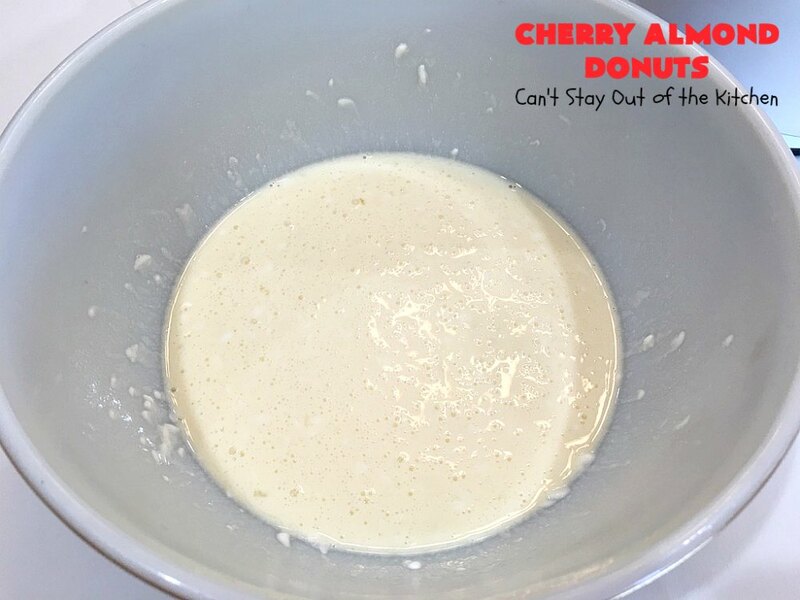 If you allow the icing to dry the cherries will not adhere. 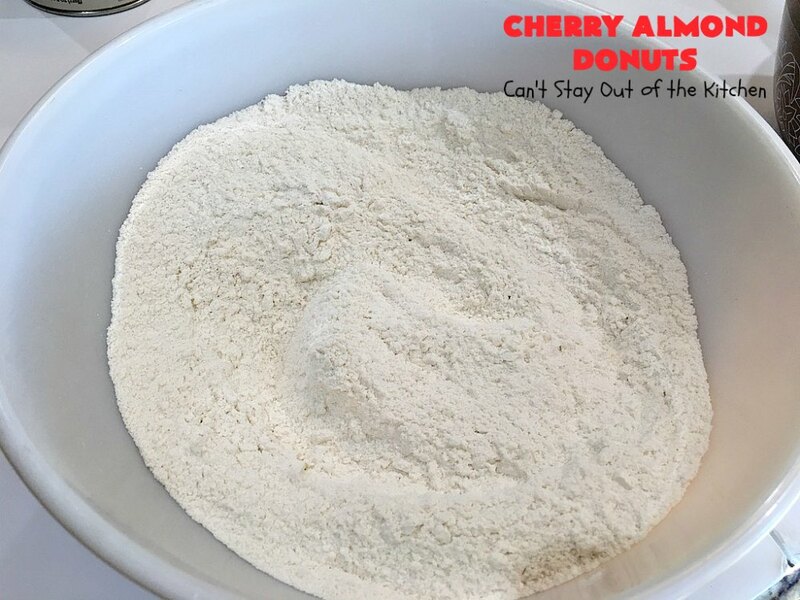 Serve Cherry Almond Donuts for Valentine’s Day, Christmas, birthdays or any other special occasion. Cherry Almond Donuts will have you drooling from the first bite. 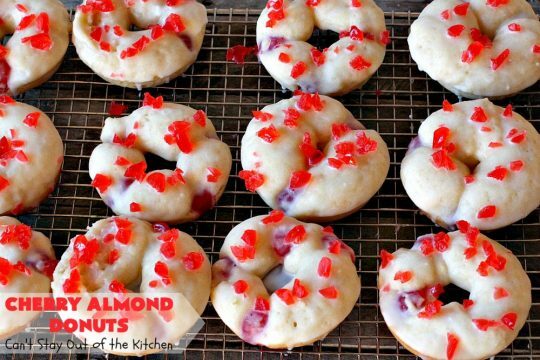 We loved the way these scrumptious donuts turned out. Cherry Almond Donuts are absolutely spectacular and the best comfort food ever! 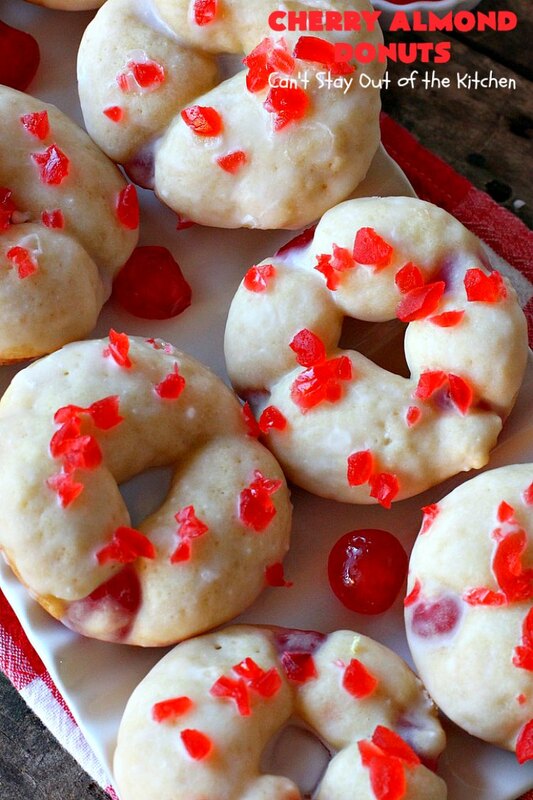 These luscious donuts have cherries and almond extract in the batter and glaze. They're perfect for Valentine's Day, Christmas, birthdays or other special occasions. These irresistible donuts will surely cure any sweet tooth craving you have, and leave you feeling so happy and satisfied! Rinse, drain and dry candied cherries. Dice into small pieces and set aside or use whole. Whisk in melted butter, canola oil, and 2 teaspoons almond extract. Pour the butter mixture and candied cherries into the flour mixture. Remove donuts from the cooling rack and dip in almond glaze. Immediately sprinkle the tops with diced cherries. 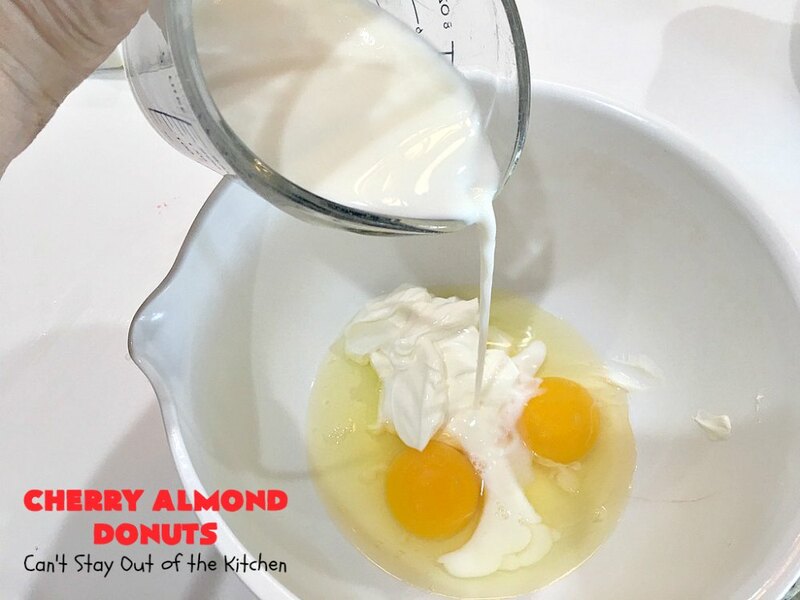 In a medium sized mixing bowl, whisk milk, powdered sugar and almond extract until smooth. 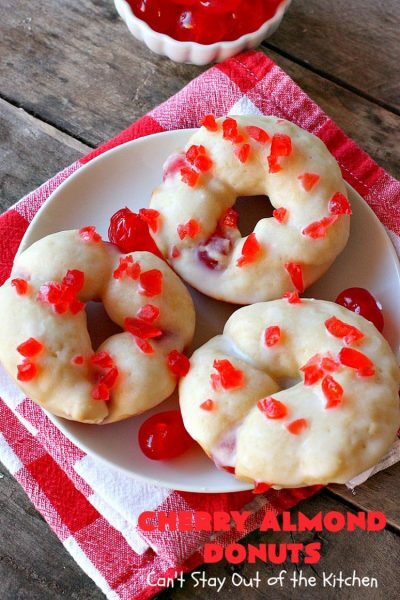 Immediately sprinkle the tops of the donuts with diced cherries. NOTE: This is enough glaze to ice 24 donuts. 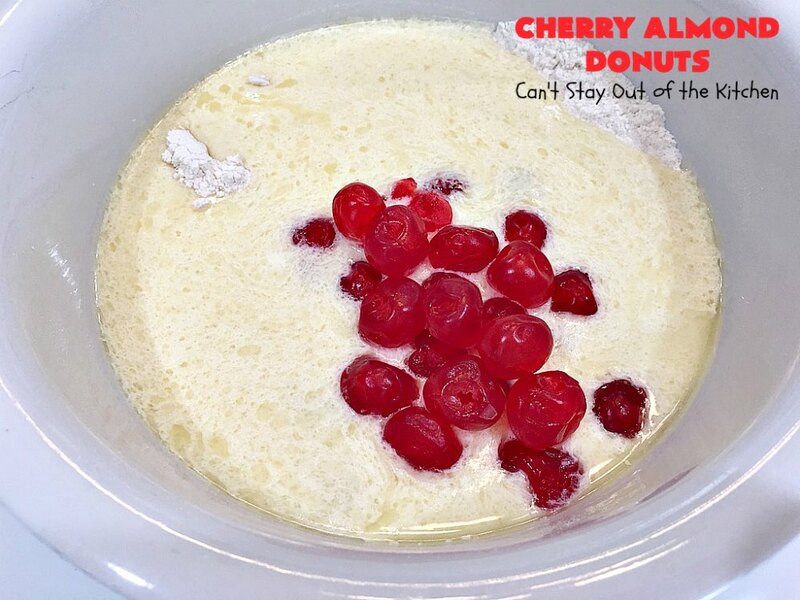 NOTE: You can use fresh or maraschino cherries. You must wash or rinse the cherries first and then dry thoroughly before using. Cherry Almond Donuts are irresistible comfort food. Believe me, I could have cleaned out all of them myself! Everyone at John’s office raved over our donuts. These were no exception. i love the chocolate ones and the creamy ones! never ever had these cherry almonds and the recipe looks easy so i can actually make it and try it out! it looks so nice teresa. Thanks, Mary. 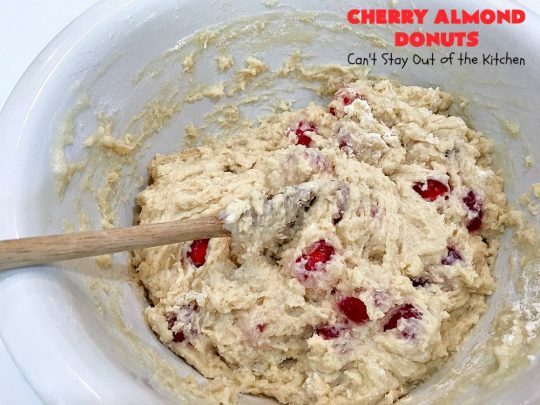 It really is a delicious recipe with chopped up cherries and almond extract. Soooo delicious. Why do you rinse the dried cherries in the Cherry Almond donuts? I used candied cherries, Michele, not dried cherries. I would do the same for maraschino cherries or fresh cherries. Unless you reconstitute the dry cherries in hot water, you won’t need to do anything.